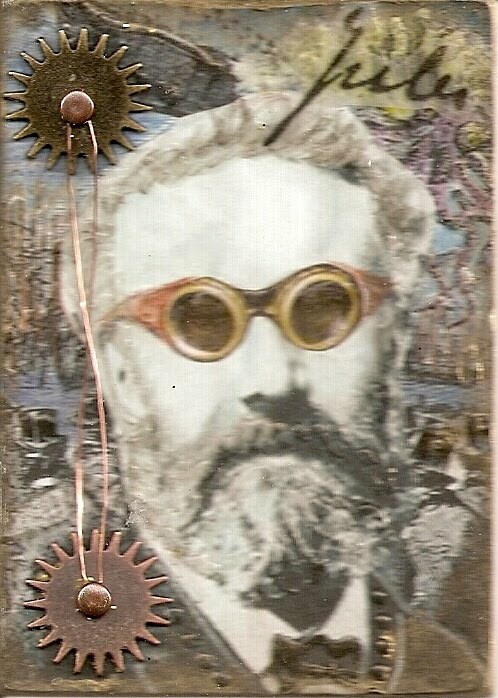 Today (February 8th, 2011) is Jules Verne’s 183th birthday. I think it should be a national holiday. Although since he’s French, I suppose it would just be a French national holiday. Regardless, today is most certainly a day for all steampunk and neo-Victorian enthusiasts, as well anyone who considers themselves a fan of classical science fiction, to celebrate! Jules Verne, author of Journey to the Center of the Earth, Around the World in Eighty Days, and Twenty Thousand Leagues Under the Sea, envisioned such futuristic technologies as underwater exploration, air travel, space exploration, holography, mass transit, and the wide-scale application of electricity. For that reason, I think we should start a world-wide Jules Verne day. Just like on Halloween, you can get dressed up–either classy Victorian-style or wild and whimsical steampunk-style. Then put on your top hat and goggles, queue up some Abney Park tunes, grab an ivory pipe and a fresh bottle of absinthe, and party like it’s 1899! If you’re still bored, you can read a biography of Jules Verne here or check out this tribute article on Verne at Make Magazine.